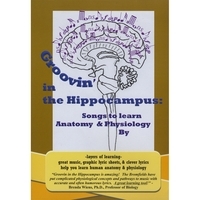 Catchy, clever songs in a variety of musical styles to help students of Anatomy and Physiology learn and memorize vital course materials. This CD makes a great gift for medical students and professionals or anyone with an interest in anatomy and physiology. The songs are not only instructive but highly entertaining, especially for people who know something about A&P. How do the songs help you learn? Consider this: Can you remember lyrics from a song you learned 5 years ago? How about information you learned for a class 5 years ago? Music facilitates learning. This music can help you learn and retain vital human anatomy & physiology course material. PLUS: Enhanced content (accessible on your computer) including lyric sheets that use color, graphics & embedded musical learning tools to help you better learn the material. © 2008 Lisa Jones Bromfield and William M. Bromfield, all rights reserved. Thank you so much for inventing such a cool CD!! I am very much looking forward to this CD helping me through my class ~ thanks so much for a much needed product.